When it comes to putting condiments on a Burger, there are times when you just want a simple Cheeseburger and then there are those days when you need the sloppiest, messiest most amazing Hamburger you find. You’re not going to be satisfied until it takes half a forest worth of napkins just to clean up your face and hands. Nothing creates a beautiful mess quite like a savory sauce can on a Burger. Whether it’s a traditional Thousand Island style or BBQ, saucing up your sando is a Burger eating right! 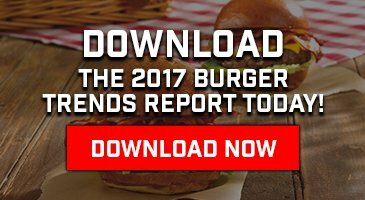 We recently explored the top cheeses on Burgers according to our 2015 Burger Trends survey. Today, we’d like to take a moment to appreciate the most popular sauces out there according to our customers. Many of our customers have gone above and beyond when it comes to creative sauce application, so they’ve shared some delectable pics that we’d like to share with you. Chef @tallowbethyname cooking down some beef bacon and onions @certifiedangusbeef education and culinary center. Can’t wait to eat this on a Burger! Sometimes also called “bacon relish,” bacon jam is made by cooking down bacon with onions. Some recipes call for vinegar, mustard, and other spices as well as mixing in a processor. We prefer butter, onions, and—if you can get your hands on it—Certified Angus Beef® Bacon. The recipe for perfection: a 1/3-pound, 100% gourmet beef patty topped with a fried egg, chicken tenders, and bacon. Then it’s covered in melty White American cheese and The Works (lettuce, tomato, yellow mustard, mayo, ketchup, pickles and onions)! They don’t call it a “classic” for nothing. This beauty comprises a fresh, grilled Burger topped with American cheese, Papa Gino’s special sauce, and shredded lettuce, served up on a grilled sesame seed bun. As wonderful as a classic may be, sometimes you gotta mix it up. Pounds & Ounces in New york City makes this giant with a kobe beef Burger, raw red onions, Neuske’s bacon, mozzarella, and a delicious basil aioli. The Force is strong with this Burger. Located in North Carolina, South Carolina, and New York state, the American Burger Company serves up this amazing Burger made with BBQ sauce, pepper jack cheese, smokehouse bacon, onions, and our award-winning Butchers Blend ground beef. When in Massachusetts, you can totally make the most of the local seafood without giving up your Burgers. This monster from The Grog is topped with brie, fried leeks, fried oysters, and Old Bay mayo, served up on a brioche bun. A beauty from our friends at Burger Warfare, the Mad Max is a spicy beauty topped with romaine lettuce, tomatoes, spicy colby jack cheese, fried jalapeños, and smoking habanero ketchup.